This is the tale of how a prince came to abandon his comfortable palace and went away to discover the secret of happiness while suffering much on the way. While this may seem like the stuff of fairy stories, it was a real man who achieved this extraordinary deed: the Buddha. 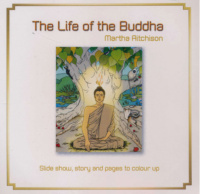 The slide show presents the Buddha's life told for children with drawings to print out and color.